ChartCo, a global supplier of maritime digital data and compliance services, has announced the launch of its new FleetManager software. As a web-based tool, FleetManager enables shore-based customers to access live ship management and tracking data in one place, at any time, on any popular browser (Chrome, Firefox, Safari, IE or Edge), as well as via smartphones and tablets. FleetManager offers a range of environmental, piracy and regulatory overlays that can highlight potential sources of delay or hazard. 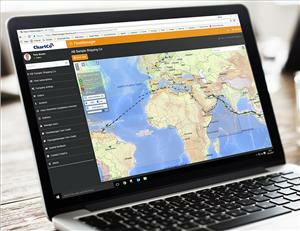 It also provides the unique ability to link with ChartCo's e-navigation platform - PassageManager. This enables shore-based staff to view an active passage plan so that any deviations from the expected track can be interrogated in real time. The basic FleetManager tool is available free of charge to existing ChartCo customers, simply by contacting a ChartCo Customer Service Manager for a username and password. No installation is needed. Premium versions are then available depending on customer requirements. FleetManager also helps managers to ensure fleet compliance with the ability to inspect any vessel remotely and to view and instantly audit its navigation and compliance status. Managers can also check software versions installed, connection history and data download volumes. They can also authorise, approve or reject electronic and paper chart and publication orders placed through PassageManager. FleetManager also offers the ability to view worldwide ENC data and emergency room tools (waypoint finder, Electronic Bearing Line and Variable Range Marker). ChartCo's CEO Martin Taylor commented: "FleetManager is the latest addition to our growing suite of software solutions designed to help shipping operators manage compliance, cost and efficiency within their fleet. Amongst its rich functionality, FleetManager is unique in being able to compare real time fleet tracking with each vessel's planned passage. "Over the coming months we also have a full roadmap of additional enhancements. ChartCo continues to lead the market and provide cost effective and easy-to-use management packages to assist efficiency in the shipping industry."